Mamma Mia! Dance Fever costume includes top, pants, and headband. 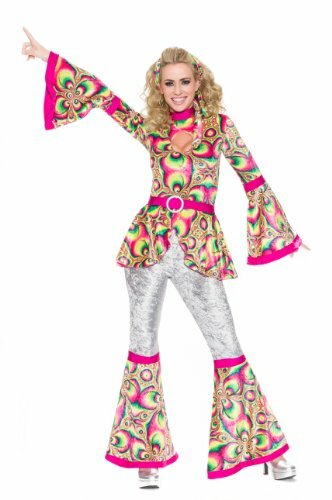 Silver crushed panne velvet combined with psychedelic print, bell-sleeves and bell-bottoms complete the look! Available in Extra Delicious sizes. Use the official Delicious Costume Size Chart to help select the best size for you. Delicious is an international designer and manufacturer of gorgeous, top-quality costumes for women from X-Small to 2X. Delicious is dedicated to celebrating beauty by creating a wide range of costume styles that empower women by making them look and feel their best. Costumes are all about embracing the opportunity to be a fun character from your fantasies, and with every design, Delicious makes that happen in a flattering and stylish way. 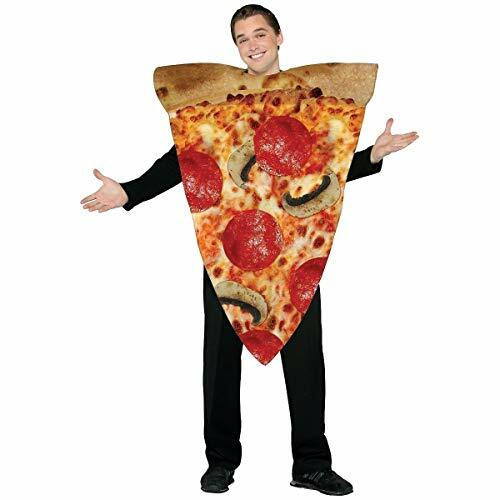 Delicious costumes are designed to let your self-confidence, individuality, and sense of style shine. The creative team behind these costumes believe that every woman deserves to look Delicious! Dive into your dream costume with the confidence you'll be beautiful for Halloween and any other costumed occasion. Totally 80's costume takes you to the decade of hair bands and punk fashion… and you make it look good in this Delicious neon pink and black mini-dress with waist cincher. Use the official Delicious Costume Size Chart to help select the best size for you. Delicious is an international designer and manufacturer of gorgeous, top-quality costumes for women from X-Small to 2X. Delicious is dedicated to celebrating beauty by creating a wide range of costume styles that empower women by making them look and feel their best. Costumes are all about embracing the opportunity to be a fun character from your fantasies, and with every design, Delicious makes that happen in a flattering and stylish way. Delicious costumes are designed to let your self-confidence, individuality, and sense of style shine. The creative team behind these costumes believe that every woman deserves to look Delicious! Dive into your dream costume with the confidence you'll be beautiful for Halloween and any other costumed occasion. 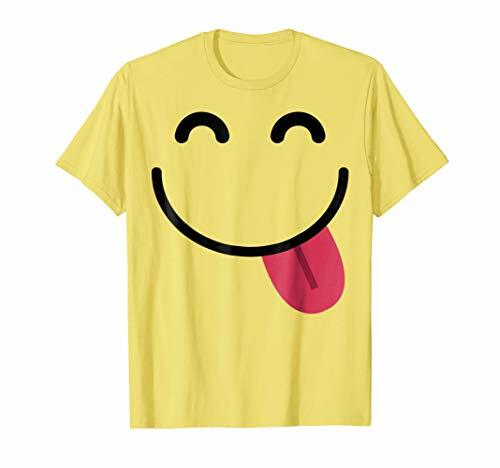 Grab this funny Delicious Emoticon Shirt as an easy, lazy, last minute costume idea for the next Halloween Drinking Party in 2018 or collect candy and sweets wearing this spooky trick or treat outfit! Perfect gift for emojis lovers! You in this costume will be the first wish fulfilled! 3 Wishes Genie Costume includes hot pink satin top with chiffon sleeves and shimmering pink lycra skirt with adjustable sash and gold trim. Use the official Delicious Costume Size Chart to help select the best size for you. Delicious is an international designer and manufacturer of gorgeous, top-quality costumes for women from X-Small to 2X. Delicious is dedicated to celebrating beauty by creating a wide range of costume styles that empower women by making them look and feel their best. Costumes are all about embracing the opportunity to be a fun character from your fantasies, and with every design, Delicious makes that happen in a flattering and stylish way. Delicious costumes are designed to let your self-confidence, individuality, and sense of style shine. The creative team behind these costumes believe that every woman deserves to look Delicious! Dive into your dream costume with the confidence you'll be beautiful for Halloween and any other costumed occasion. Nothing looks better than a woman in uniform. The Delicious professional-inspired line of costumes is a flirty tip of the hat to the women out there who work hard every day, whether they're keeping people safe or healing their wounds. Use the official Delicious Costume Size Chart to help select the best size for you. Delicious is an international designer and manufacturer of gorgeous, top-quality costumes for women from X-Small to 2X. Delicious is dedicated to celebrating beauty by creating a wide range of costume styles that empower women by making them look and feel their best. Costumes are all about embracing the opportunity to be a fun character from your fantasies, and with every design, Delicious makes that happen in a flattering and stylish way. Delicious costumes are designed to let your self-confidence, individuality, and sense of style shine. The creative team behind these costumes believe that every woman deserves to look Delicious! Dive into your dream costume with the confidence you'll be beautiful for Halloween and any other costumed occasion.